It was a rough year to be an investor in the retail pharmacy giant. Can the company get back on track in 2017? 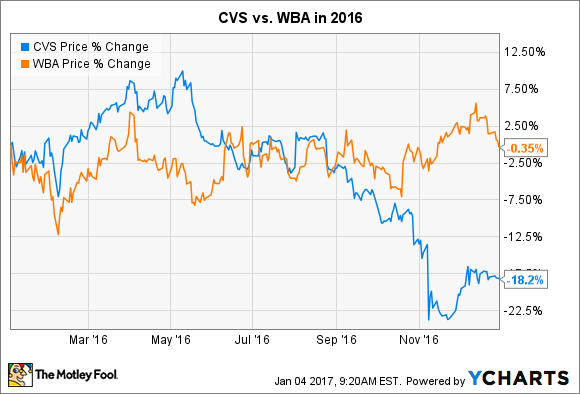 Investors in CVS Health (NYSE:CVS) should be quite relieved to finally put 2016 in the rearview mirror. Shares of the retail pharmacy giant fell by more than 18% during 2016, according to data from S&P Global Market Intelligence. That vastly underperformed the company's biggest rival, Walgreens Boots Alliance (NASDAQ:WBA). CVS Health's year was going just fine up until August. The company produced a string of earnings reports that showed double-digit growth on its top and bottom lines. Management also took advantage of the market's weakness to start the year by buying back nearly $4 billion worth of stock in the first two quarters. However, shares started to show weakness in August after news broke that Walgreens had signed a deal with Prime Therapeutics, the fourth-largest pharmacy benefits manager (PBM) in the country. The agreement is expected to push many of Prime's 22 million members to visit Walgreens' pharmacies instead of CVS'. If that wasn't bad enough, just a month later Tricare -- the insurance program for the U.S. military -- stated that it was leaving CVS Health's network to link up with Walgreens. Since Tricare provides coverage to over 9 million Americans, this news was another big blow to CVS. In response to all of these network changes, CVS Health's management decided to dial back its full-year EPS guidance for both 2016 and 2017. Understandably, this news didn't sit well with investors; shares fell by more than 12% when the news was announced, and the stock has remained weak ever since. While the near term is looking murky for CVS Health, I can't help but feel that the selling is nearing an end. After all, CVS Health continues to have a number of growth initiatives working in its favor, including the Minute Clinic rollout, growth in specialty pharmaceuticals and infusion services, and the company's big push into the long-term care market. In addition, management has also announced plans to leverage the company's technology investments in an effort to cut costs. When added together, CEO Larry Merlo continues to believe that the company should still be able to put up 10% annual growth in adjusted earnings per share over the long term. That's a solid growth rate for a company that is trading at a below-market multiple. There's no doubt that 2016 wasn't CVS Health's finest year, but with 10,000 baby boomers retiring every day, the wind remains at this company's back. With share of CVS Health now trading at a bargain price, I think it's a great time to get in.